Hello everyone, and welcome back to the second half of our monthly partnership with Altered Pages. 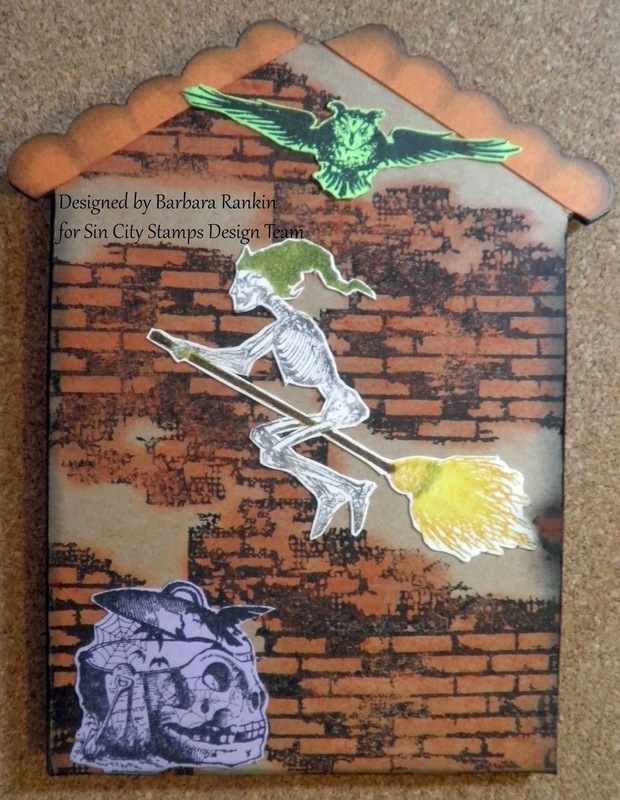 For the next two weeks, both design teams will be creating Halloween themed projects using products from both Sin City Stamps and Altered Pages. So if you love Halloween, like I do, you won't want to miss all the inspiration from both design teams. I had a hard time deciding what to make, but then I saw this house-shaped gift card holder die from Eileen Hull. Instantly, I knew exactly what I wanted to do with it. So, in keeping with the genre, I turned that house into a mausoleum. Oooooh, spooky, right? 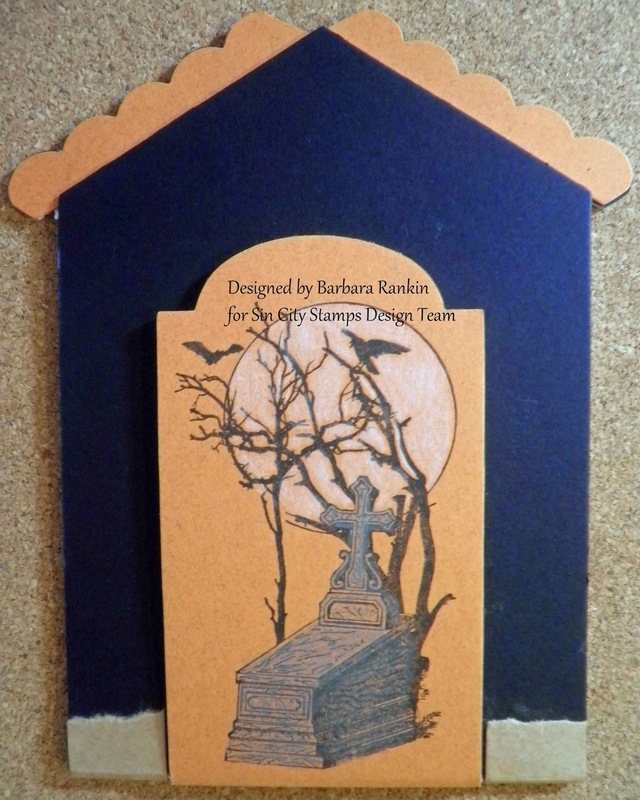 Die cut house gift card holder from black chipboard or matboard. Die cut back panel only from orange card stock. Adhere to inside back panel. 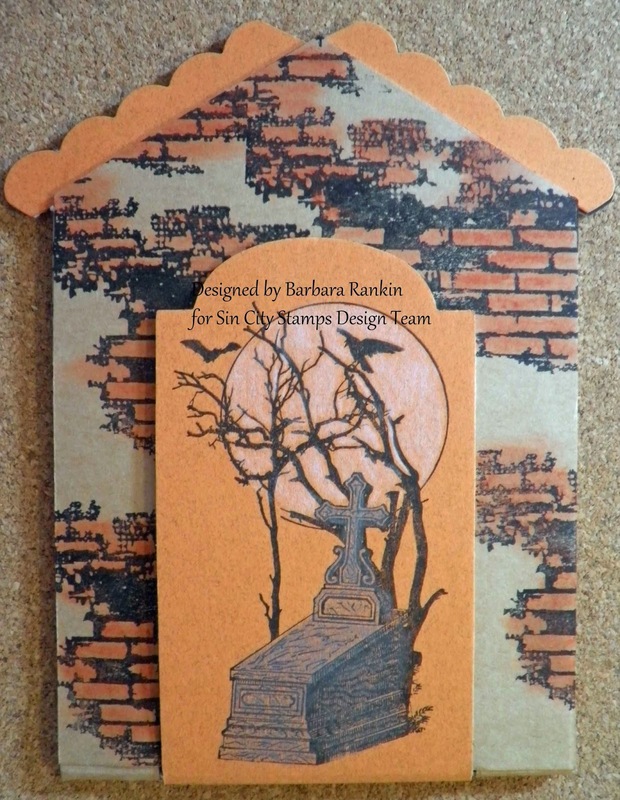 Print "Greetings at Halloween" collage image onto white paper, trim, and adhere to back piece, centering through door opening. Lay strips of Scor tape around edges of front inside panel, as shown. Die cut another gift card holder from kraft card stock. Separate door from front panel and set rest of die cut aside. 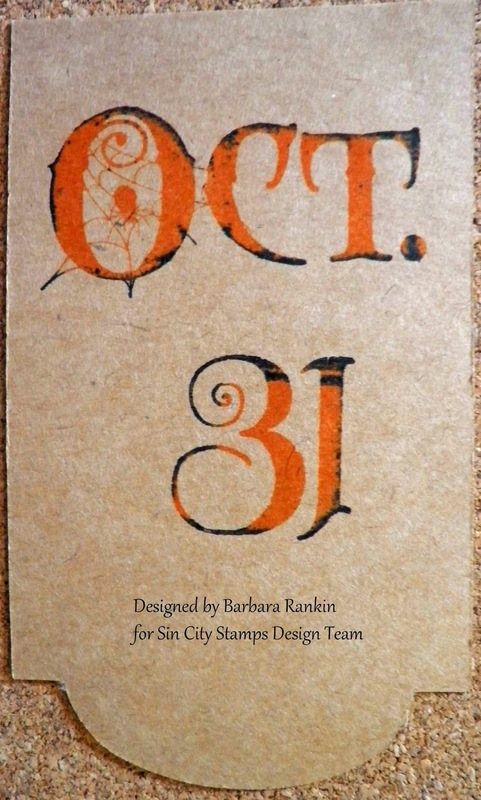 Stamp "Oct. 31" from Halloween Bingo stamp set onto card stock with Orange Zest StazOn ink, edging with black Staz On, as shown. Remember to stamp it so that when the door is opened, the viewer can read it. Adhere to door panel on the inside, as shown in Figure 1. 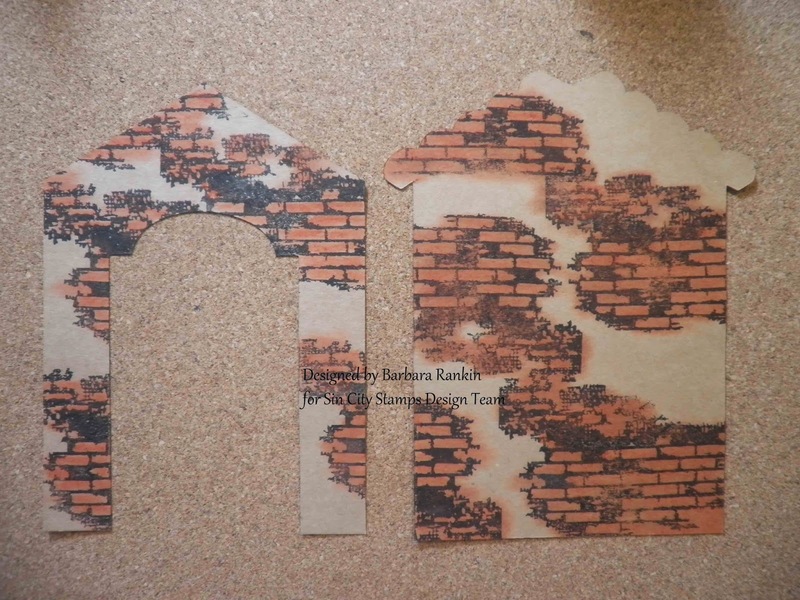 Remove adhesive paper from Scor Tape, close chipboard and adhere front panel to back panel. Cut door section only from orange card stock. Leave some extra length at the bottom of the door to wrap over fold. 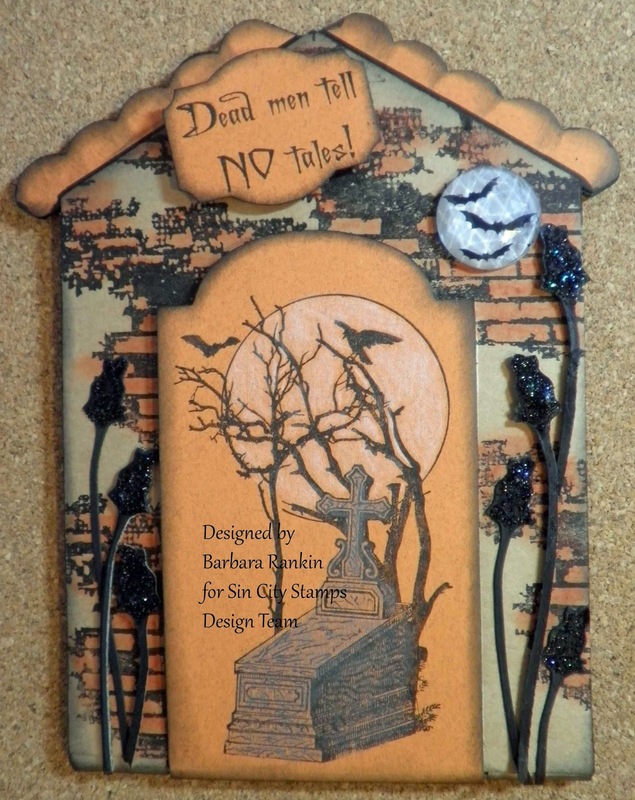 Stamp tombstone moon onto center with black ink, color moon with white pencil and the tombstone with gray pencil. Adhere to front door panel, wrapping extra length over fold at bottom. Adhere two small strips of the same kraft card stock to cover the fold on either side of the door, as shown. 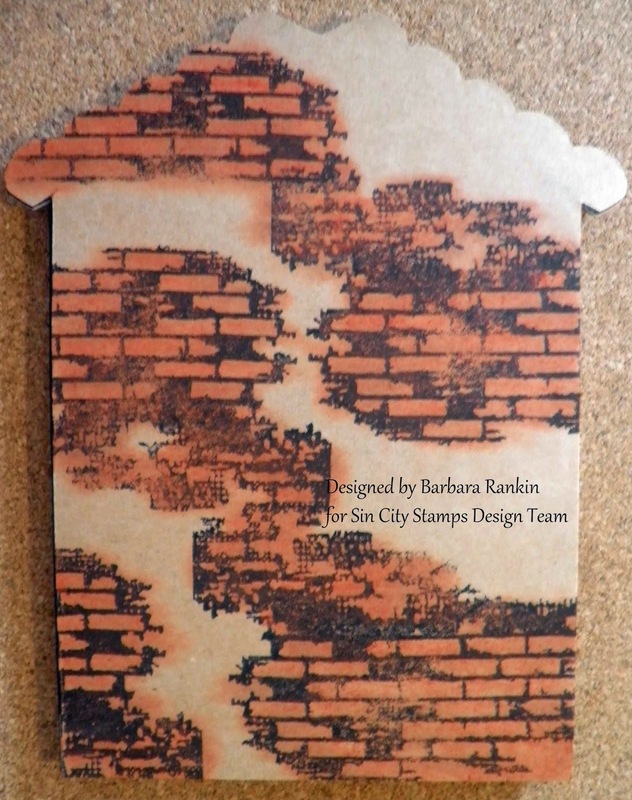 Stamp brick background with black ink randomly over kraft card stock die cuts, as shown. Apply yellow and brown oil pastels over brick work, blend with cotton swab dampened with odorless mineral spirits. Adhere front and back panels, respectively. This will cover those small strips you added earlier. Die cut one more strip of the orange cardstock to make the roof line on the back panel. 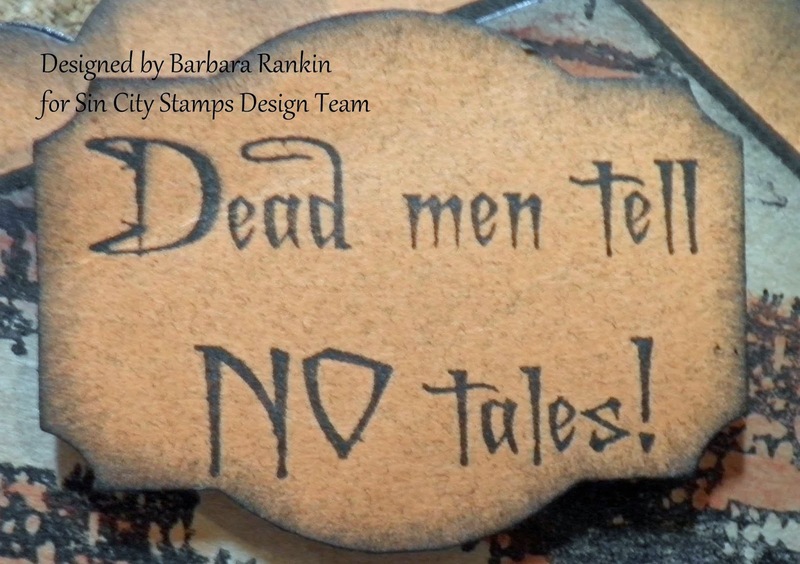 Stamp "Dead Men Tell No Tales" onto orange card stock with black ink, punch with decorative punch, distress edges with black, adhere to front with foam dots. Die cut 7 roses from black chipboard, adhere to front panel. Apply Stickles glitter glue in Black Diamond over roses. 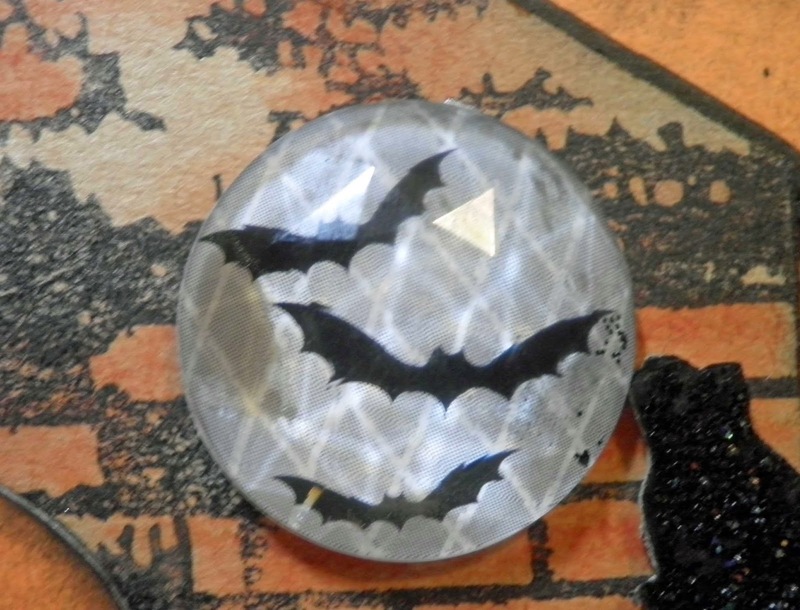 Adhere one Glitz rhinestone (bats) onto front. Stamp skull pot with black ink onto purple scrap cardstock. Fussy cut and adhere to bottom of back panel, as shown. 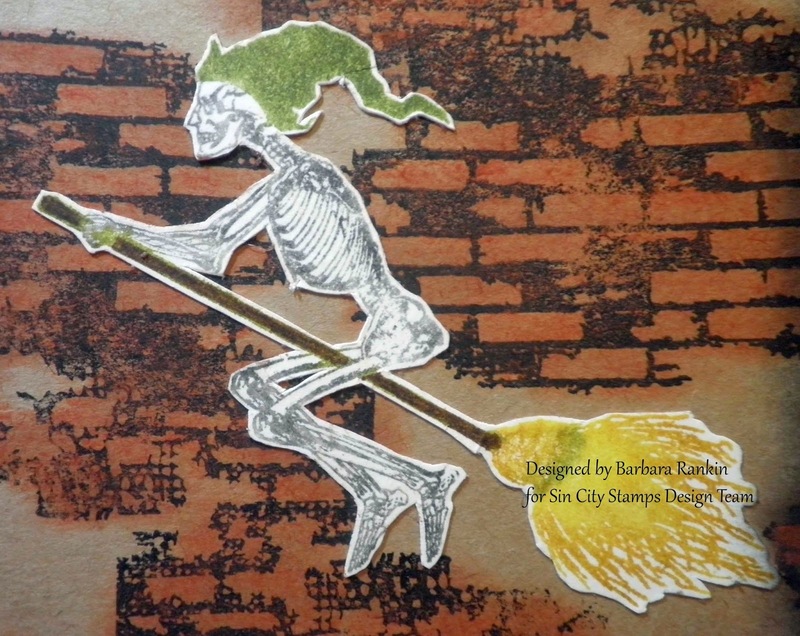 Stamp flying skeleton onto white card stock, coloring directly onto stamp with Distress ink markers. Huff before stamping to re-moisten the ink. Fussy cut and adhere to back panel, as shown. Stamp small owl with moon onto scrap green card stock with black ink, fussy cut owl only, adhere to back panel, as shown. Distress ink all edges with Black Soot, and use Big Brush Artist Pen in black around matboard edges. And here is the complete gift card holder with the front door open. You can see the beautiful lady inside, waiting to cast a spell on you! I hope you have enjoyed my project today, and inspired you to get started on your Halloween projects. Both Sin City Stamps and Altered Pages have a wonderful supply of products for all of your creative needs. I hope you will take a look at their online shops, and please be sure to visit both teams for more fun Halloween projects this month. Thanks for stopping by, and have a wonderful, creative weekend! What a great project.. love it!!! Awesome, as always! You continue to amaze me! This project is awesome! 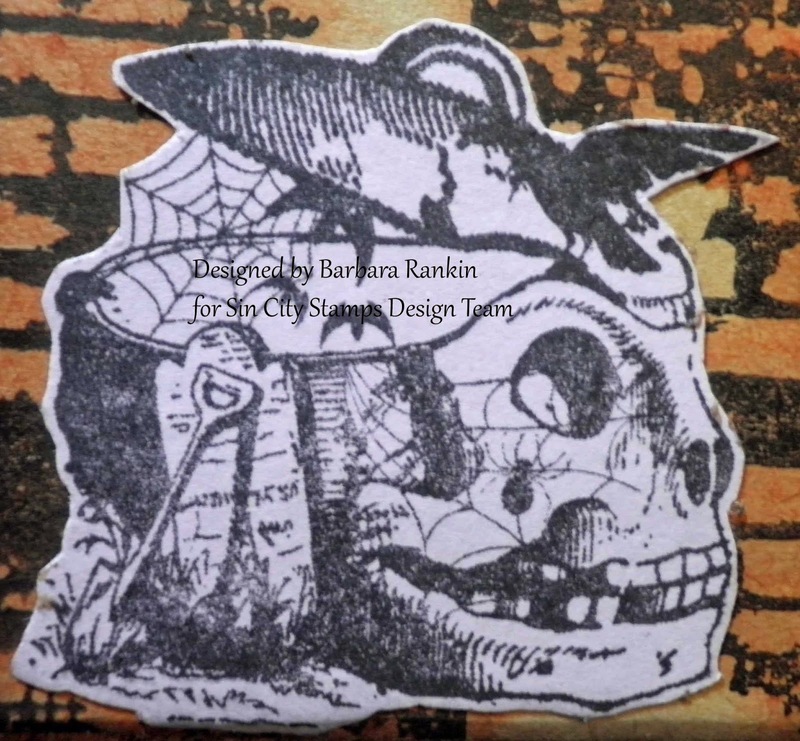 You used some of my favorite Sin City stamps on it, too! Thanks for sharing.